Major Mayhem 2 is now finally available worldwide. This time, it has been published by Rocket Jump. The original version of this game series has crossed over 10 million downloads on Google Play Store and still, it is getting hits. 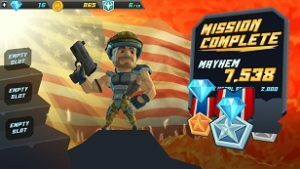 In this post, we have covered everything about the game; Major Mayhem 2 cheats, tips, and tricks to get the gold medal at every stage. As usual, Major Mayhem 2 game starts with a tutorial in which you learn about the basic of the game; how to jump, how to shoot, dodge, and much more. All you need to do is tap on the enemy to start shooting. The game features 50 challenging missions and it would not be easy for you to get the gold medal at each stage. Your objective is to earn the 150 medals(50 missions*3 medals<three stars/medals at each stage>=150). Major Mayhem 2 also features boss battles in which you fight against the evil boss. So, there are dozens of unique weapons & guns to collect in Major Mayhem 2 game. How to unlock new weapons & guns? You need blueprints to unlock a specific gun and weapon. The player can obtain these blueprints from the chests. And the chest can be obtained by collecting the Mayhem points. Once you earned enough blueprints of a specific weapon or gun, you can unlock it or re-assemble it using coins or gems. Earn Mayhem points by playing the game. Best Guns In Major Mayhem 2? At the beginning of the game, you have a standard weapon which is of low-quality. Heroic, epic, and elite weapons are the best to shoot down the enemies fast and easily. In-Game Currency – How to obtain? So, this is the basic Major Mayhem 2 guide, overview. Let’s start the Major Mayhem 2 cheats, tips, and tricks to grab the gold medal at every stage. For normal combos, you just have to shoot down the enemies back-to-back without delaying. By making combos, you can increase the number of mayhem points per damage. If you keep shooting down the enemies continuously[for a long time], the bonus from combo will increase. To make an epic combo – use the environment; for instance, fire on airplanes and destroy them to make an explosive blast. You will lose combo boost if the major gets hit by the enemy. So, dodge their attacks. As stated above, the levels become more hard and difficult as you progress in the game. And with a low-quality gun or weapon, you can not beat the powerful enemy. It would be great if you upgrade the weapons or guns. Upgrading the gun increases its attributes such as damage per second, ammo, speed, and fire rate. But don’t spend your coins on upgrading very low-quality weapons. Go to the store and from there you could get the best deal on blueprints; buy them in exchange for coins and equip to the character. Coins used in buying and upgrading the weapons. One of the best ways to easily acquire coins is by repeating the easy levels. Play them again for coins. Energy points are limited and re-generates after every few minutes. Without energy points, you can not play the game. So, don’t use energy points to revive. You can use the time-lapse cheat to recover the energy instantly in Major Mayhem 2 game. All you need to do is go to the mobile settings and then change the time; set it to next minutes. For instance; if time is 5:10PM, set it to 5:30PM. Go back to game and BOOM! you just got the energy.